Five talented emerging makers unveil the results of their £7,500 Jerwood Makers Open commissions this week in London. We talk to the Director of the Jerwood Charitable Foundation and two of this year’s selected makers about the project. Embroidery, the ancient Japanese art of paper cutting and ceramics all feature in this year’s Jerwood Makers Open. The exhibition includes ambitious new works by conceptual maker Maisie Broadhead, jeweller Linda Brothwell, site-responsive ceramiscist Adam Buick, kiri-e paper artist Nahoko Kojima and embroiderer Roanna Wells. The five makers were selected in December from a UK-wide open submission process which attracted over 200 applications. Judged by designer Edward Barber, Stanley Picker Gallery Director David Falkner and Ceramic Review Editor Bonnie Kemske, each maker was offered a commission of £7,500, affording them the opportunity to freely develop new ideas central to their individual practice. The resulting works range from photographic and film installations to a 2.5m high paper sculpture. 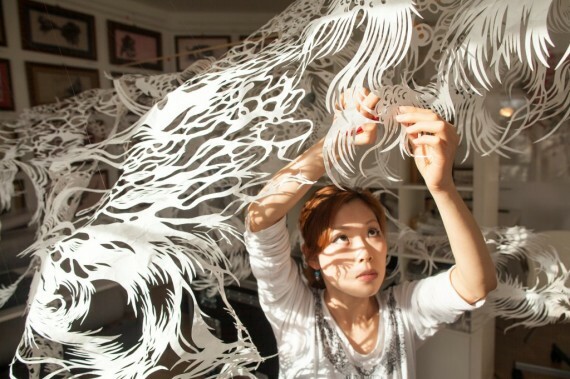 Nahoko Kojima began practicing her contemporary version of kiri-e, the Japanese art of paper cutting, in 1987. Since then she has exhibited widely, co-founding the art, design and branding company Solo & Kojima that enables her to apply her extraordinary skills to contemporary problems such as environmental packaging, as well as pursuing her own artistic visions. For emerging artist Roanna Wells, Jerwood Makers Open has helped her to take a huge step forward in her use of photographic source material. A 2009 graduate of Manchester School of Art’s BA Embroidery course, Wells usually translates found images from major global events onto fabric. For the Jerwood Makers Open she has been able to travel to India and directly commission aerial photography over the Kumbh Mela religious gathering. The resulting works are a development of her Interpersonal Spatial Arrangements series which distill aerial photographs of crowds through needlepoint into abstract mappings. 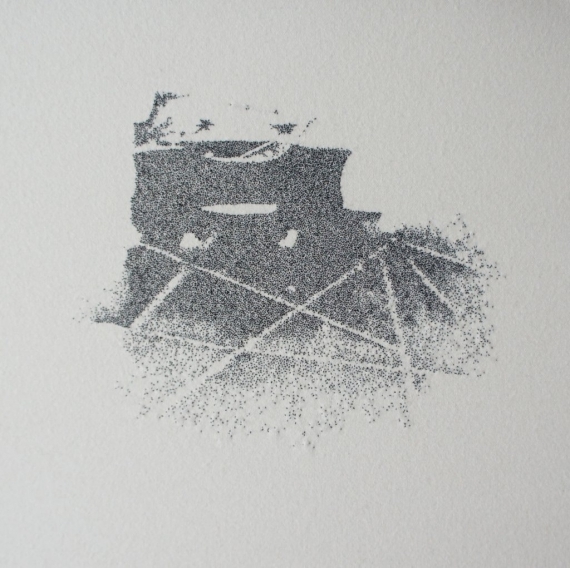 Tiny figures, dispersed like dust into a range of groupings, suggest an inherent fragility to human life on the planet. Each title allows us an insight into the nature of the gathering, be it a political rally, a drowning accident or a concert, enabling the viewer to make their own analysis of the political, social and cultural impetuses for these crowd formations. Jerwood Makers Open 2013, Jerwood Space, London, 10 July – 25 August. National touring dates will be announced on Jerwood Visual Arts.